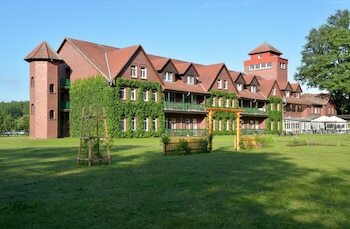 With a stay at Waldhotel Eiche in Lübbenau/Spreewald, you'll be on the waterfront, and 9.7 mi (15.6 km) from Slavic Fort Raddusch and 14.6 mi (23.5 km) from Spreewelten Bad. Featured amenities include a computer station, complimentary newspapers in the lobby, and luggage storage. Planning an event in Lübbenau/Spreewald? This hotel has 3488 square feet (324 square meters) of space consisting of conference space and meeting rooms. Guests may use a train station pick-up service for a surcharge, and free self parking is available onsite. With a stay at Happy Hostel Berlin in Berlin (Mitte), you'll be within a 5-minute drive of Reichstag Building and Victory Column. The front desk is staffed during limited hours.